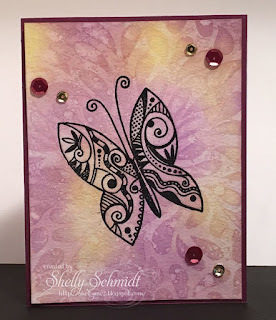 This month for the Challenge Your Stash theme this month was given to us by Darlene, and she chose the there to use NO Designer/Patterned Paper. I covered watercolor paper with Distress inks in purple and yellow. Next, I spritzed a stencil and laid it down on the paper (wet side down). The water reacts with the inks and makes this cool pattern. 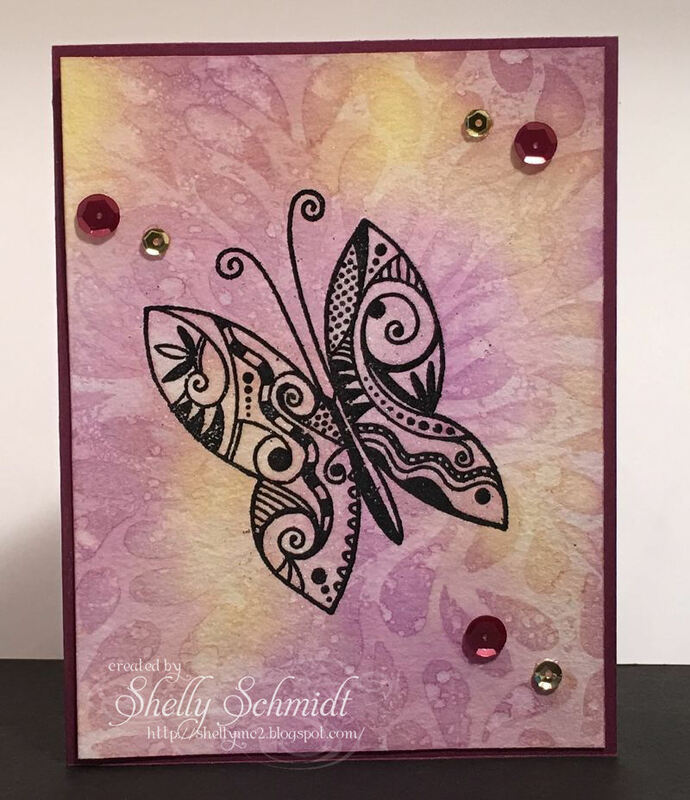 Once dry, I stamped and embossed the butterfly. I added sequins for a nice final touch. The CYS group can be located here. List mom Barb had the brilliant idea- lets use our stash items- with a monthly theme, I am sure finding no shortage of items to use in my creative space for this challenge...!!! Even those in the 'get rid of' pile....... HERE is a link to all of the August cards the group members posted for this challenge. Moving along with the times- Starts with a "B"
Shelly, this is gorgeous. Great background and embossing. I know what you mean about the stash, hehe. Shelly, what a gorgeous background! I ma going to have to try this out. Beautiful card and I love the sparkle of the sequins. Distress inks are so fun to play with and I love your color combo. Have a great week. We are off on vacation. Tom says I need to get away from the grand babies for a while and Mom and Dad need to learn to do it on their own. Guess they are going to get a crash course. LOL! What a brilliant background. Who needs designer papers eh? I absolutely love how you made the background. I may have to try that soon! Pretty card! WOW! You've created a beautiful card with your own background. Lovely! What a gorgeous background you have created for this wonderful zentangle butterfly! !